http://www.biljanaart.com/ “Whirling Wisdom Creations unfolds the soul medicine journeys of Biljana BanchotovaArtwork that inspire vision, find collective light and planetary healing! http://www.eolithdesigns.co.uk/ Eolith designs produce limited edition sculptures from an original master sculpture whose inspiration is rooted in ancient history and spirituality. http://fineartamerica.com/profiles/kasi-kennedy.html Kasi A. Kennedy is an artist working in Austin, Texas. She is a native Texan who loves to travel but appreciates and finds inspiration in the creeks, forests and wild places of her native soil. http://indigeneart.com/ As the ancients honored the sacred feminine, Indigene presents images of women taking one to the path of feminine divine. http://www.anniecaswell.com/ Kissed By Fire Creations sells Figurative /Goddess inspired clay sculptures and pendants. There are also Spirit Dolls and Paintings for sale. http://www.lizalambertini.com/ Uplifting Esoteric Fairy and Goddess art celebrating the beauty in the life force of living things and our connection to Gaia. http://www.etsy.com/shop/dublinroots Handmade one of a kind creations, wool sculptures and wall hangings consist of 100% wool fiber, no imitations, no fillers, no instructions...just a need to create. http://www.myrareichel.com/ Myra Reichel, Tapestry Weaver. Contemporary hand woven tapestries for your commercial or residential areas by Myra Reichel, Media, PA.
http://www.magickalgraphics.com/ A graphic site for all your social networking needs, such as Myspace, Ning networks, Tagged, Hi5, and Bebo! http://www.suzannesart.com/ Sacred Divine Feminine art by Suzanne Cheryl Gardner. Metaphysical and nature art that touches the soul. http://www.christopherhulme.com/ Christopher Hulme’s work attempts to express spiritual values of harmony and beauty in abstract symbolism through the different mediums he uses. http://www.sacredmotherarts.com/ Sacred Mother Arts - featuring the sacred art of Mavis Gewant. Original watercolor deity paintings on silk and paper, yantras and matted prints. http://www.artbymonica.com/ Monica Stadalski - Award winning Northern NY artist living in Evans Mills specializing in soft pastels, murals, fiber art, graphic design and printing. http://www.blueheronvisions.com/ Vicky Lynn Macchione creates collage greeting cards, paintings, and other Soul-full artwork by intuitively employing the alchemy of words and images. http://www.moonbowartworks.com/ Jen Otey is an artist creating intuitive works of art that speak to people on a deeply spiritual level. http://www.phyllistarlow.com. Phyllis's website featuring her oil landscapes and including her blog entries about personal art experiences and adventures. http://www.BiljanaArt.com/ Whirling Wisdom Creations unfolds the shamanic soul journeys of Biljana Banchotova. Artwork that inspire vision; find collective light and planetary healing. http://mypaganland.blogspot.com/ My Pagan Land - the art of Morgaine: photographs, original paintings, prints and greeting cards. http://www.diana-art.com/ Diana Gamerman, a Virginia-based artist, works in a wide range of media such as oil paintings, watercolors, prints and ceramics. http://www.suemillerart.com/ Sue Miller Art - art is her life and life is her art. http://www.johnfpeters.com/ John Francis Peters Art ... Paintings with Nature in mind. http://www.elenaparashko.com/ Seascape, landscape, still life, botanical illustration and contemporary art inspired by the beauty of nature. Original artwork and downloadable painting demonstrations. http://abundanceunlimited.net/ Abundanceunlimited.net is the home site for Aura Rose, Desert Mermaid Productions, and the Abundance Unlimited Art Gallery & Store. http://www.molliekellogg.com/ Figurative paintings by Mollie Kellogg explore mysticism, spirituality, and a deep connection with nature. http://www.catbeings.com/ Discover your connection to the ancient wisdom of the Egyptian Cat Beings. Download their monthly message of guidance and empowerment. http://www.earthartinternational.com/ Earth Art International - Original art by Sue Coccia. http://www.suzannegyseman.co.uk/ Paintings by Suzanne Gyseman inspired by the natural world, the faerie and angelic realms, myth, folklore, fairytales and dreams. http://www.samanthagrayson.com/ Writer of personalised and unique fairy and fantasy stories. Also information on fairylore, fairy places, traditional fairy tales, folklore, superstitions, herbalism and crystals. http://www.juliebruton-seal.com/ Site of Julie Bruton-Seal, herbalist, writer, artist and photographer, co-author of Hedgerow Medicine - harvest and make your own herbal remedies (May 2008). http://www.robynbellospirito.com/ The Art of Robyn Bellospirito - all are original art works in oil and other media. http://www.luludesign.com/ Kathy Crabbe is a Canadian born Southern California artist. http://www.thefarawayhills.com/ The Faraway Hills - a collection of the art of Cathy Connolly. http://www.camyart.com/ Fantasy and fairy art of Camilla Costa. http://www.marjoleinart.com/ The official art gallery of fantasy artist Marjolein Gulinski. http://www.marlahenderson.com/ Marla Henderson Design: Rugs, Furniture, Textiles, Spaces. http://www.lizwelch.net/ These images are an expression of love and gratitude to the spirit that connects us all, I hope you enjoy them. http://www.goddessonearth.com/ GODDESS ON EARTH is a collection of powerful and life-affirming photographic images of women as the Goddesses. http://www.lindaravenscroft.com/ Fairies and enchantment await within the watercolour visions of artist Linda Ravenscroft. http://www.artofwoman.com.au/ Margaret Kalms’ photography explores ideas and symbolism about womanhood, menstruation and female sexuality using props, costume and the female body. http://www.camiasdesigns.com/ Camias Jewelry Designs - creations forged from the heart. http://www.mosazone.com/ Mosazone - the world and work of Mosa (Mimi) Baczewska - Musician, Artist, Vocal Workshop Facilitator; Mimosa Music, DrumStuff, Gemstones and more. http://www.fairiesworld.com/ and http://www.flowerfaeries.com/ - the sites of fantasy artist Myrea Pettit. http://www.joannabarnum.com/ Joanna Barnum’s work explores various archetypes through personal and traditional symbolism. She works as a freelance illustrator across several genres. http://www.josephinewall.com/ Welcome to the world of fantasy art by Josephine Wall. http://www.travellingstoryteller.com.au/ Anna Jarrett is an internationally acclaimed storyteller living in Australia. 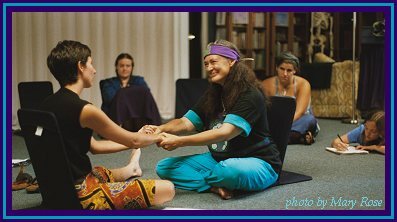 Creative story and energy work bringing light and healing for body, mind and spirit. http://www.wlwilkerson.com/ Paintings by Wendy L Wilkerson. http://www.elfies-world.com/ The site of artist Maria van Bruggen (“Elfies”). http://www.HagerPhoto.com/ Stephanie Hager Photography. Specializing in architecture, location, people, and active lifestyles. http://www.judisilvano.com/ Judi Silvano - vocalist, composer and musician. http://www.danstarproductions.net/ Featuring song, dance and inspiration from songwriters Soroca and Allocca. http://www.Einbenderstudios.com Leather masks and purses with faces molded in bas-relief. Celebrating our deep connections as children of the same Great Mother. http://www.houseoflukaya.com/ I create these ancestrally inspired sculptures to honor my relationship with spirit. Each piece weaves together the mysteries, myths, and truths that make up the human experience. http://www.colorbakery.com/ Color Bakery - Beautiful and unusual art gifts and home decor accents for the unapologetic color addict. http://www.wlwilkerson.com Features the gouache paintings of Wendy Wilkerson. The art is her response and attempt to represent diverse religions, cultures, and races. http://www.elainesilver.com/ Elaine Silver - Music, Recordings, Performances. http://www.raintreenaturenotes.com Woman-owned business featuring notecards with prints of original art, mostly watercolor, all nature-oriented. Blank inside, ready for your unique message. http://www.francegarrido.com/ France Garrido - Seduction into another world...A world of vision and dream. http://www.angelfire.com/art2/laurencurtis Lauren Curtis enjoys creating spiritual & nature-based artwork in a variety of mediums for herself, exhibitions, and clients across the country & abroad. http://www.theaskitchen.com/ Thea’s Kitchen features musical journeys, recipes, herbal medicine, poetry, photography and more. http://www.thegypsybutterfly.com/ Welcome to the home of Gypsy Butterfly! A website designed to help you build spiritual, mental and physical strength! http://www.kanika.us/ Kanika African Sculptures and Black Art: African masks, figurines, ethnic goddesses and angels, breast cancer survivor jewelry, and more hand-sculpted from clay and adorned with African fabric, leather, and beadwork. http://www.newmoonvisions.com/ Artist Mara Berendt Friedman - Images Honoring the Sacred Feminine. http://www.angelsbysharae.com/ Sharae Taylor is an internationally recognized Intuitive Visionary Angel Artist whose Angel paintings hang in the homes, galleries, offices and healing centers worldwide. http://www.theaandthegreenman.com/ Thea & the Green Man are singer-songwriters Cynthia Stacey and Chuck Willhide. http://www.marinapetro.com/ Marina Petro - gifted visionary artist and psychic. Gallery featuring healing art, original paintings and prints. http://www.kellymoore.net/ Raw Art by Kelly Moore - "My work is primarily about the integration of the Light and Dark within myself." http://www.etherealart.com/ Ethereal Art of Marcia Snedecor. Oil paintings and prints inspired by Nature, mythology and the Divine Feminine will touch, nourish and inspire. http://www.marybakerart.com/ The Illuminating Silence – Mary Baker, contemporary realist painter in Newburyport, MA, known for her crisp realistic paintings. http://www.enchanted-art.com/ The enchanted art gallery of mythic fantasy artist Jessica Galbreth. http://www.hranajanto.com/ Hrana Janto – illustration and illumination. http://www.faunfables.net/ Website of Dawn “The Faun” McCarthy. http://www.stephanielewisrobertson.com/ Stephanie Lewis Robertson – Fabric Artist. Specializing in custom dyed and printed fabrics which celebrate and honor the spiritual journey. http://www.universaldancer.com/ Instructor Leslie Zehr teaches the Alchemy of Dance as a way to experience the strong transformational energy of the Goddess. http://www.melissaharris.com/ Images celebrating woman’s love of life, beauty, nature and magic. http://www.shankar-gallery.com/index.html Shankar Gallery - art for the soul. http://www.kathianderson.com/ Kathi Anderson – visual artist. http://www.rootsheartpulse.com/ "Percussion is just the beginning!" Two empowered, versatile, female hand drummers - changing the world, beat by beat, song by song. http://www.lindascreativeoutlet.com/ Linda’s Creative Outlet - Realism, impressionism, abstracts, drawings, paintings, graphic design, striking photography and name plaques for children. http://www.londonderryinn.com Maya Kearn Fine Art. Paintings on display at The Londonderry Inn Gallery, http://www.londonderryinn.com/. http://www.greenleesforest.com/ Greenlee’s Forest – handcrafted jewelry and wearable art, using the finest semi precious stones, sterling silver, artisan beads, Balinese silver and things found in nature. http://www.celticdreaming.com/ Ethically produced Gold and Sterling Silver Celtic jewelery authentic in it's Celtic design and beautifully hand carved by Celtic jeweller, Desmond Mackenzie-Harris D. Ua. http://www.suzannesart.com/ Suzanne - The artist who paints the magic of life. http://www.touchdrawing.com/ Artist Deborah Koff-Chapin shares a wealth of images and inspiring stories about Touch Drawing and SoulCards. Find her teaching schedule, products, articles and more! http://www.sallymckenna.com/ Sally Mc Kenna is a professional artist and sculptor for over twenty years. Sally's imagery stems from natural life forms in various stages of growth and flight. http://www.artbyjennifer.ca/ Gentle original art for the gentle soul. Jennifer's paintings are stories about our connections to people and places. Enjoy the mystery. http://www.sacreddream.com/ Sacred women's music by Lisa Thiel. http://avivagold.com Aviva Gold and Painting From the Source workshops. http://www.soul-guidance.com Esoteric artwork by Carol Herzer and Dirk Gillabel, including tarot decks, singing bowls, and paintings. http://www.melissaharris.com/creatrix/ Celebrating women's love of life, beauty, nature and magic. http://www.thesacredfeminine.com/ Montserrat - an artist that wishes to inspire healing, universal love, and the preservation of Mother Earth. http://users.lmi.net/maxdashu/ Art of Max Dashu - This whole universe comes out of that Goddess. http://www.candydarling.com Women En Large - photos by Laurie Toby Edison. http://www.motherpeace.com A tarot deck for women that is based on 30,000 years of symbols that celebrate Goddess cultures throughout the world. Created by Karen Vogel and Vickie Noble. http://www.seniwatigallery.com/ Seniwati Visual Art Galleries - Supporting the women and children artists of Bali. http://www.homemadeinamerica.com/ “Today’s enjoyment and tomorrow’s keepsakes”. http://www.boneart.co.nz/ The Bone Art Place is a collective of some of the finest artists and crafts people from around New Zealand. http://www.womanmade.org/ Woman Made Gallery supports all women in the arts by providing opportunities, awareness and advocacy. http://www.vivagarcia.com/ is the virtual gallery of artist Veronica Piastuch, her colleagues and her art students. http://www.durgabernhard.com/ A gallery of over 200 original works of art by illustrator/artist Durga Bernhard (as seen in Susun Weed's herbal book Healing Wise and forthcoming Healing Well). http://www.goddessalive.co.uk/ Goddess Alive! magazine, a magazine of Goddess celebration and research. Goddess research articles, news, reviews, events and regular columns. http://www.goddesstherapy.com/ Linda E. Savage, Ph.D. author of Reclaiming Goddess Sexuality, which presents a powerful new way of understanding women’s sexuality. http://pagaian.org/ Where the recently published book PaGaian Cosmology: Re-inventing Earth-based Goddess Religion by Glenys Livingstone Ph.D. is freely available to read. http://www.arttimesjournal.com/ ART TIMES, published since 1984, provides commentary and resources for the fine and performing arts. http://www.matrifocus.com/ MatriFocus is a seasonal ezine for Goddess Women and others. http://www.thelunapress.com/ The Lunar Calendar provides a key to the language of poetic myth, sparking inspiration for people who follow many spiritual paths. http://www.durgapuja-cards.com/ Welcome Durga Maa and celebrate this auspicious occasion by sending lovely Durga Puja Cards, Greetings and Ecards. http://www.starhawk.org/pagan/pagan-goddess.html Starhawk, the author of The Spiral Dance, The Fifth Sacred Thing, and other books that link an earth-based spirituality to action to change the world. http://www.wemoon.ws/ We’Moon is an astrological moon calendar, an ecofeminist appointment book, a daily guide to natural rhythms, and a lunar perspective through the 13 moons of the year. http://www.crescentmagazine.com/ Pagan publication of art, philosophy, and belief. http://www.moontree.net/ MoonTree~ Transformational Journeys with the Sacred Feminine. Ancient History sacred seminars, year-long programs. http://www.c4ia.org/ Center for Independent Artists. http://www.trytel.com/~brittq Providing papermaking kits, related materials, workshops, handmade papers and bookbinding supplies; specializing in custom built wove and laid molds. http://www.neith.org/ Healing through photography. Commissioned portraits and photographic symbology workshops in Hawai'i and BC to create awareness with which to guide your life. http://www.goddessworld.co.uk Goddessworld - web of connections - dedicated to the international world of the Goddess, the Female Consciousness, the Creatrix in all her forms, the Female within us all. http://www.goddessmound.com This site is designed to help people access a spiritual connection to goddess-related art, sculpture, books and other resources. http://www.herspace.com/ Feed your heart - fuel your art - promoting and supporting female artists. http://www.artheals.org Arts & Healing Network: a resource healing potential of art. Includes directory. http://www.goddess-studio.com/ The Goddess Studio is dedicated to honoring the Sacred Feminine and empowering women. http://www.goddesstempleoforangecounty.com/ Women of the Sacred Feminine priestessing the earth towards peace and prosperity. http://www.goddessgift.net/ Goddess Statues, Miniatures, Tapestries, Jewelry, Drums, Sistrums, Candle Shrines, Rubber Stamps, and Stickers. Ancient 'Herstorical' Wisdom and museum reproductions. http://www.goddessdownload.com/ Downloadable audio rituals for lunar phases and seasonal holy-day, including altar decoration, grounding, elemental invocations, circle casting, lore and ritual activity. http://www.goddessconference.com/ Glastonbury Goddess Conference celebrates the Wild Maiden Goddess. http://www.goddessmyths.com/ Paintings of goddesses with their accompanying mythology from cultures around the globe by Sandra M Stanton. http://www.lunaea.com/ I'm Lunaea Weatherstone. It has been my privilege to serve the Goddess community for more than twenty years as priestess, writer, artist, and tarot counselor. http://www.goddesstimeline.com/ 32,000 years of goddess images - because the feminine is simply divine. http://www.goddessconference.com/ Goddess Conference 2007 (1st-5th August) in Glastonbury - Celebrating the Crone Goddess at Lammas. http://www.goddess-gift.com/ Goddess Gift: Discover Your Personal Goddess Type offers a rare look into what it really means for a woman to find her inner goddess and deeply connect with it. http://www.divinexpressions.com.au/ The Female Metaphor in Her triple aspects of Virgin, Mother and Crone may be celebrated in all Being – re-creating ourselves. http://www.daughtersofthegoddess.com/ We are a community of womyn, a tradition of Dianic, Goddess-centered, earth-based spirituality, and a ritual circle. http://www.jodineturner.com/ Jodine Turner’s visionary fiction trilogy shares the story of the Goddess and Her priestesses during three critical eras of spiritual transition. http://www.goddess.com.au/ Feel beautiful, sassy and inspired when you reconnect with your inner goddess at www.goddess.com.au. http://www.thegoddessdancing.com/ The Goddess Dancing is a group of master belly dance teachers dedicated to empowering people through the dance. http://www.wisdomofthecrone.com/ This exquisite set of 54 cards contain insightful words and images of women between the ages of 50 and 100.
http://www.sacredsource.com/ Sacred Source: Ancient Images, Ancient Wisdom. Goddess and God statues and museum reproductions from many cultures and eras. Also books, music and jewelry. http://www.wildeartharts.com/ Wild Earth is committed to the creation, promotion and prosperity of women’s sacred art. All our products are ethically made and environmentally friendly. http://www.motherpeace.com/ Motherpeace Tarot – by Vicki Noble and Karen Vogel. http://www.zbudapest.com/ Zsuzsanna Budapest -- Psychic, Wiccan, Author. Founding mother of feminist spirituality movement. learn about the Goddess, ourselves as women, and the natural world. http://www.thegoddessnetwork.net/ The Goddess Network is a resource for helping women achieve balance by bringing the Divine Feminine Spirit into their personal and organizational lives. http://www.templebellydance.com Come home to your Body, the Temple of your Soul and re-emerge as a Temple Belly Dancer once again! http://www.oymygoddess.com/ One of a kind, personalized goddess figurines by Joanne Dorsch. http:// www.absolutearts.com/portfolios/z/zimmerwoman/ Goddess Art - Creations of Jeniffer ZimmerWoman. http://www.bodytemple.info Body Temple is a spiritual opera, a tantric circus, a performing mystery school, a shamanic journey. http://www.goddess-pages.co.uk/ Goddess Pages: A journal of Goddess Spirituality in the 21st Century. http://www.mothergoddess.com/ This site is dedicated to the female aspect of Creator and Creation – She whose back we walk on and whose food we eat. Mother Earth. http://members.aol.com/ATOYA/Goddess.html This site has lots of information on everything you ever wanted to know about “all this Goddess stuff”! http://www.goddess2000.org/SiteMap.html Goddess Temple at the Spiral Goddess Grove. http://www.liberalmafia.org/darkgoddesses/DarkGoddess.html The darker side of the Goddess and the goddesses -- essays, graphics, research and prose, counterbalancing all the sweetness and light imagery." http://www.blueroebuck.com/index.html a tour of the World of the Goddess and Her Sacred Trees. http://sacredearthdesigns.com Sacred Earth Designs: Original goddess jewelry, shrines, and sculptures honoring the feminine divine.